Oct. 25, 1949, Look; Duke ‘n’ Duchess’s quick retort. Parody Of: Look. Title: “Dook (and Duchess).” Parody By: Duke and Duchess. Date: November 19, 1949. Length: 28 pages plus covers. Availability: Hard to find; one copy sold on eBay in late 2017. College humor mags were prone to grumble-brag about how much time and effort they put into parody issues, but they could turn one out quickly enough with the right motivation. 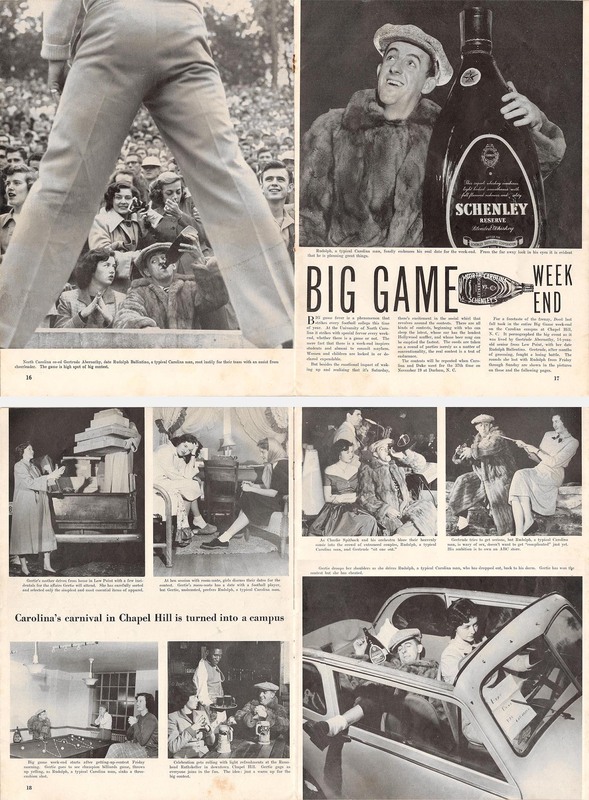 Take Duke University’s Duke and Duchess (1936-51), which sprang into action in the fall of 1949 after Look devoted six pages to homecoming celebrations at hated rival UNC. Look had shot the feature the previous November, when the Tar Heels, led by two-time All American Charlie “Choo Choo” Justice, skunked the Blue Devils 20-0 in Chapel Hill. It was published in the issue dated October 25, 1949, which came out around mid-month. The D’n’D’s response appeared November 19, the day the two schools clashed again at Duke’s homecoming in Durham. Opening and last page of Look’s “Big Game” feature. “Dook” is so well done it’s hard to believe editor Art Steuer and staff put it together in only four weeks — or less, as it likely spent a week at the printer. The highlight is associate editor Walt Wadlington’s almost shot-by-shot spoof of Look’s account of the big weekend “as it was lived by Betty Lokey, pretty, 21-year-old senior from Raleigh, with her date, Jake Bowman.” The D’n’D’s version followed “Gertude Abernathy, 14-year-old senior from Low Point” and date Rudoph Ballentino (“a typical Carolina man” whose ambition is to own a liquor store) from their first meeting in a pool hall Friday morning through Rudoph’s drunken collapse on Sunday. Duke sophomore Kate Bullington and senior Earl Humphrey gamely posed as the mismatched couple. Almost every page of the parody was modeled on a specific page in the 10/25 Look. 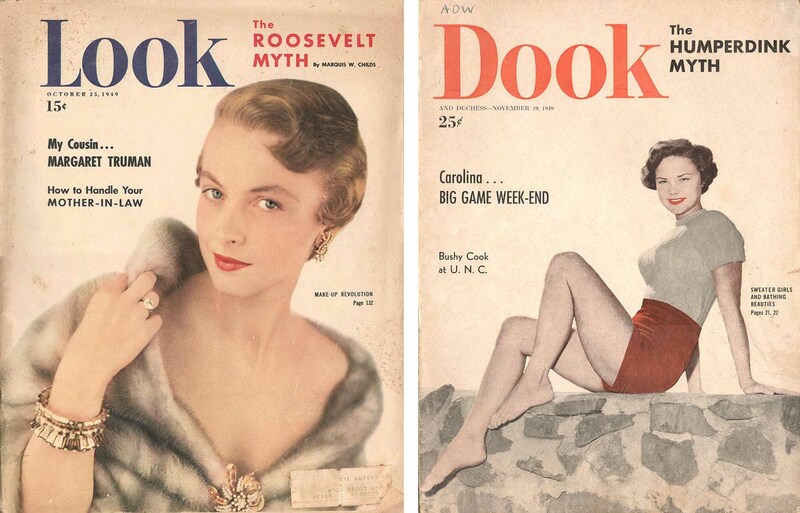 “Dook” aped Look’s lead story on FDR’s legacy with a similar take on one Hubert Humperdink. (“MYTH: He founded Duke University under the fictitious name of Benjamin Duke. 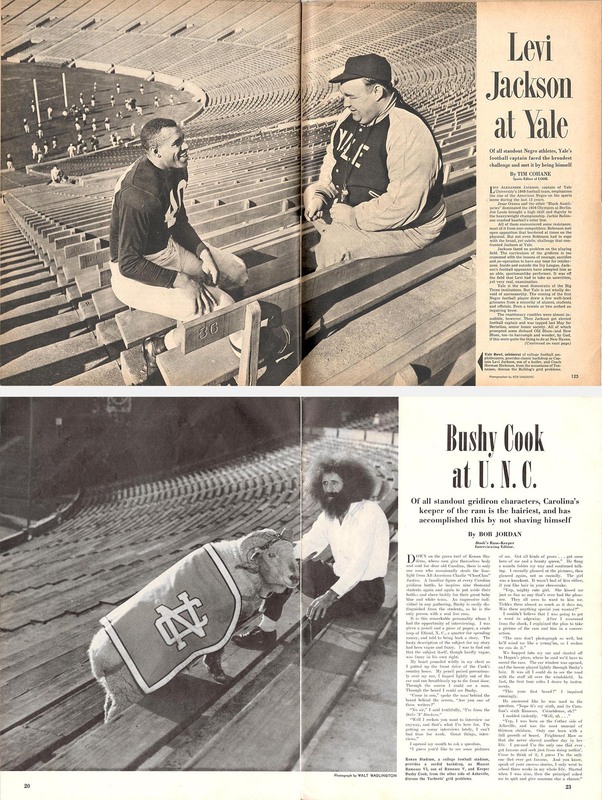 FACT: He did found the University of North Carolina under the fictitious name of North Carolina.”) There were also fake letters to the editor, a “Dook Photocrime” and a version of Look’s most-parodied feature, the Photoquiz. A profile of the unkempt mountaineer who cared for UNC mascot Ramses the Ram might strike current readers as too broad for effective satire, but Bob Jordan’s reporting was strictly factual. George B. “Bushy” Cook was a former textile worker from Haywood County, N.C., who settled on a farm near Chapel Hill after World War II; he was Ramses’s official guardian from 1947 to 1957 and died in 1974 at the age of 76. This entry was posted in College Parodies, College: 1946 on and tagged 1940s, College, Duke, Look, Magazine, UNC. Bookmark the permalink.